Monday evening marked the beginning of Passover. My family had the good fortune of observing the day with our dear friends, Dan and Valeri Remark. The Remarks opened their lovely home to seventeen guests. We had a wonderful time and enjoyed delicious food prepared by Dan, a chef, as well as matzo ball soup, roasted vegetables, and assorted cheeses provided by other guests. I made the charoset and received many compliments. The Seder hosted by the Remarks was relaxed and welcoming. Guests had the opportunity to ask questions if they didn’t understand or comment with insight. Roman, Dan and Valeri’s grandson, did an excellent job asking the four required questions and opening the door for Elijah. Our son, Joshua, and the Remarks son-in-law, Quentin, engaged in a challenge to see who could eat the most horseradish. Quentin consumed three slices the size of a quarter, and Joshua managed to down four. Joshua was fine for the first few moments until the pungency of the root vegetable reached his nose. Luckily, Joshua is a good sport who joined in the laughter as his face reddened and he gulped grape juice to cool the burn. One elegant touch I’ll be sure to borrow from Valeri if I ever host my own Passover Seder is to offer my guests warmed, damp washcloths scented with orange essential oil for the custom of washing one’s hands. Another is the use of a broken piece of pottery to collect the drops of wine while reciting the ten plagues three times each. Giving up foods with yeast/leavening for eight days may seem like a huge sacrifice. Yeast/leavening appears in places one wouldn’t expect such as canned broth and soup, prepared meatballs, and salad dressing. It requires a little reworking of the menu when you can’t grab the items you’re used to. Yet what we receive in return is so much more and makes up for the minor inconvenience of denying ourselves yeast/leavening for eight days. The fellowship of the Seder alone is worth it, not to mention the freely flowing wine, love, and laughter we enjoyed at the Remarks. 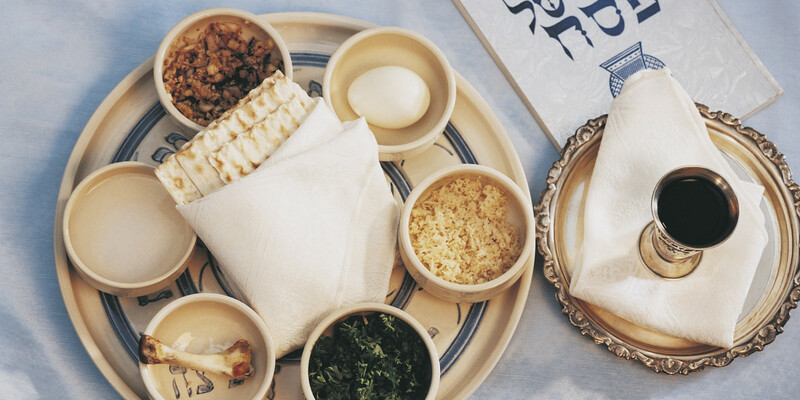 Then there is the opportunity to reflect on Passover and what it means for us today. Toss the diced apples with the toasted walnuts. Combine the wine, honey, brown sugar, cinnamon, and allspice. Whisk thoroughly and pour over the apple/walnut mixture. Stir several times to coat before covering. Allow to marinate in the refrigerator for at least an hour. Stir again before serving. Serve chilled at the Seder with pieces of matzo. When John Welles’s best friend, Sam Feldman, invited him to a party Sam’s mother was hosting, John was not at all enthused. Sam, who always had a girlfriend on his arm, wanted John to run interference for him as he dodged the girl his mother wanted him to meet. Little could either young man have predicted how captivating Abigail Cohen, called Babby, would prove to be. Not only was Babby beautiful, the young school teacher was intelligent, articulate, and poised. John began to rethink his opinion about dating Babby, but not in time. By the end of the party, Sam and Babby hit it off exactly as Sam’s mother knew they would. John did not begrudge Sam his good fortune. Rather, he and Claude Willoughby were the best men at Sam and Babby’s wedding. Being Jewish meant Sam and Babby took their vows under a chuppah. 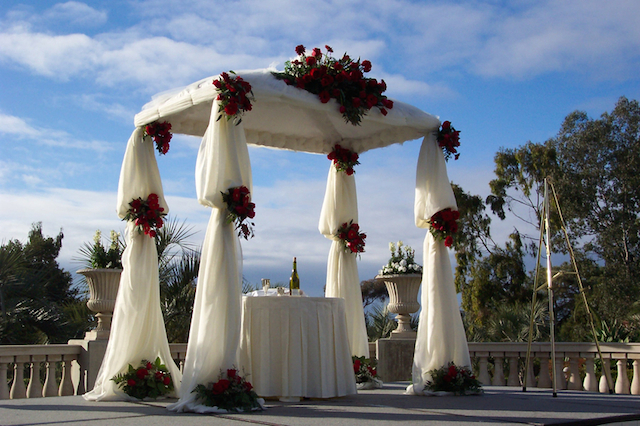 A chuppah is a Jewish wedding canopy with four open sides. 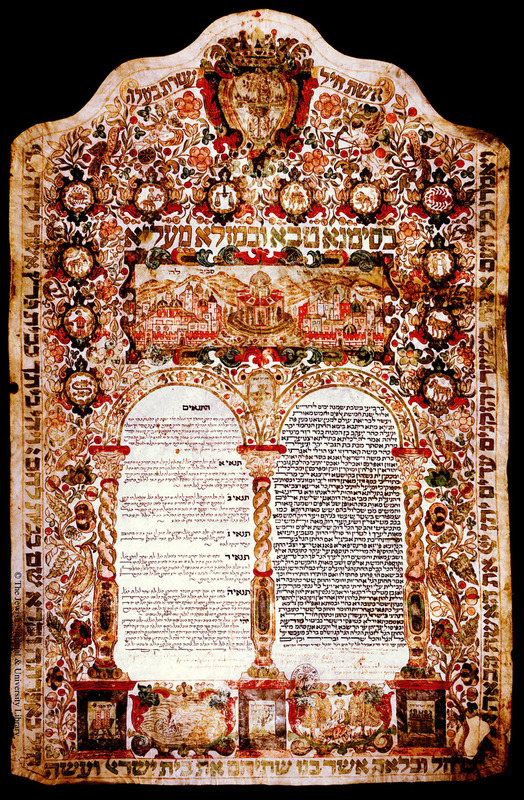 There are many traditions surrounding the chuppah, and they have changed throughout the years depending on an orthodox or modern interpretation. 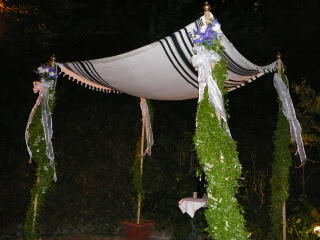 The chuppah is usually a square of cloth supported by four poles. The fabric can be as elegant as silk or velvet, as simple as cotton or linen, or as important as an heirloom piece of lace or tallit belonging to a family member. The poles can be free-standing or held in place by friends of the couple. Either way, the poles should touch the ground. It is a great honor to be asked to hold the chuppah poles, and this role is often given to people very close to the couple. Many couples like to decorate the chuppah poles and tops to match the theme of their wedding. 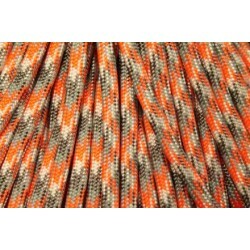 Whatever material is chosen, be sure that it will withstand unpredictable weather conditions if the ceremony is outdoors. Ruining a family heirloom or the collapse of an unsteady chuppah will definitely spoil the wedding. The purpose of the chuppah is to symbolize the new home the couple will create. At one time, the cloth chuppah was draped around the bride and groom but was later spread over their heads. Ancient rabbis compared the chuppah to Abraham’s tent during Biblical times. Abraham was famous for his hospitality, and since his tent was open on all four sides, travelers could enter from any direction. The bride and groom are brought to the chuppah by both parents. The space inside the chuppah should be big enough for the couple, clergy, and a small table for ritual items such as wine and glasses. The bride will also need enough room to circle her groom without tripping or snagging her dress. Don’t forget to make the chuppah tall enough for the tallest person to stand under without hitting the fabric where it will drag in the center. Family and friends in the wedding party, including parents, often stand outside the chuppah. Afterward, the new couple can receive guests in their chuppah as a symbol of the love and openness of the home they will build together. January of 1958 found Dr. John Welles alone and bored. He could usually count on the weather to keep him busy with the typical winter illnesses of colds, sore throats, and flu, but the residents of Addison were driven inside to hibernate much like the doctor himself. After a vigorous round of house cleaning and catching up on his pleasure reading, Dr. Welles was saved from his tedium by a dinner invitation from Reuben and Hannah Wise. The Wises were humble people who offered the very best they had to Dr. Welles including homemade grape juice to drink with dinner. When the tangy beverage was incorporated into the dinner blessing, Dr. Welles suspected there was more to his neighbors than met the eye. But it is the Wises’ request made during dinner that truly shook the foundations of their friendship with the doctor. 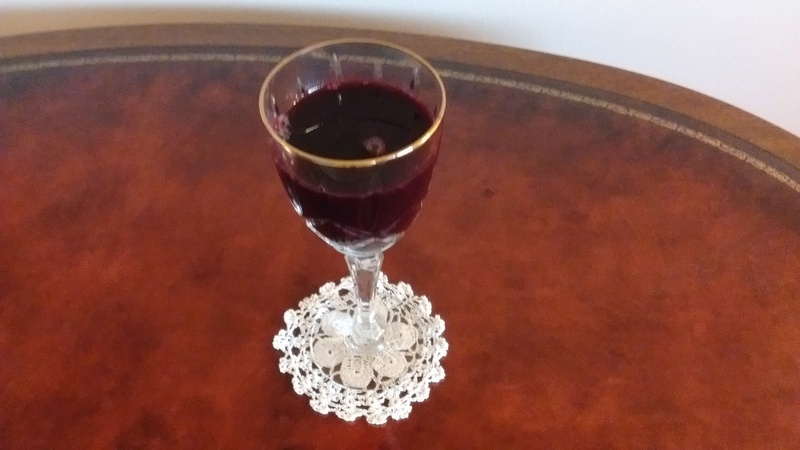 There really isn’t a recipe for making grape juice; it’s more of a quantity issue. 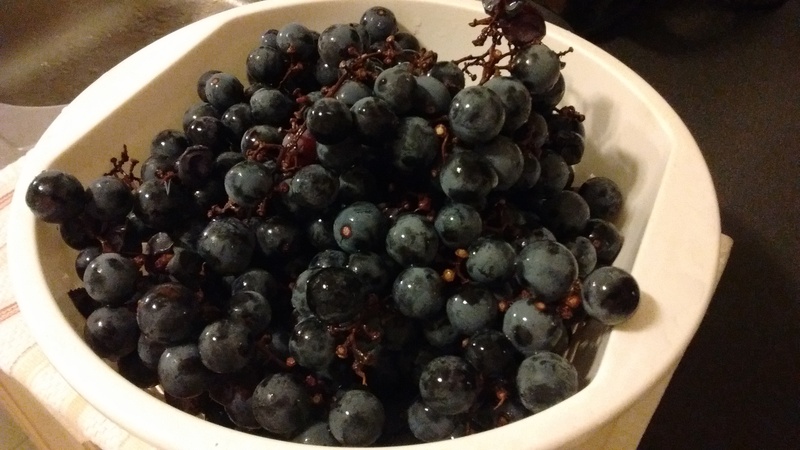 For the sake of this post, I used two one-quart containers of concord grapes which yielded exactly 3 ½ cups of juice. After tasting it, I can see why people make it in large batches to drink on the spot and/or can it for the winter. Whether picking or purchasing grapes, place them in a colander and rinse thoroughly under cold water. Discard any grapes that are insect damaged, smashed, moldy, shriveled, or imperfect in any way. Remove the good grapes from the stem and place them in a pot large enough for your desired quantity. Some people prefer to add just enough water to cover the grapes for the cooking process, but I find this weakens the flavor somewhat. 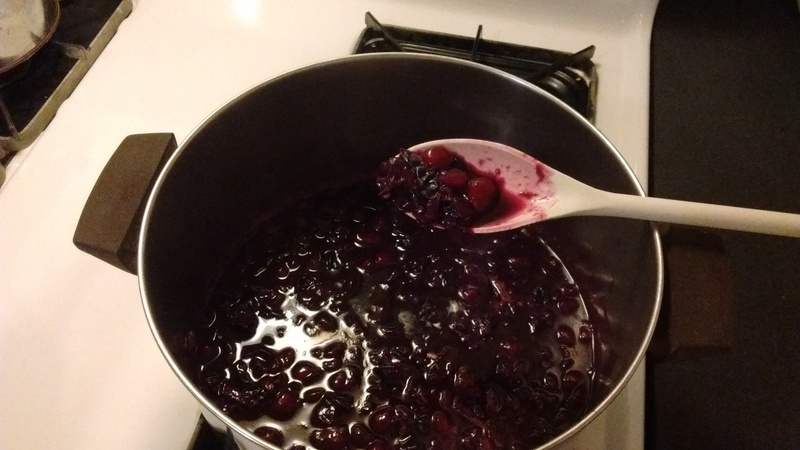 Mash the grapes with a potato masher and bring to a simmer over a low heat. Don’t heat them quickly or boil them. Stir frequently to keep the grapes from sticking to the bottom. Once they reach a decent simmer, time them for ten minutes. Mash the grapes again half way through the cooking process. Carefully pour or ladle the smashed grapes through a fine wire sieve, with or without cheesecloth, which has been set over another pot or bowl of adequate size. Gently stir through the mash to extract all the juice. Depending on your quantity, you may need to finish this step in the refrigerator overnight. Allow any sediment to settle to the bottom. Straining the juice once more through cheesecloth will ensure that most of the sediment is removed. Depending on your taste, you can add sugar to the grape juice or drink as is. I added two tablespoons of raw sugar to the above-mentioned quantity, but really, it’s up to you. I recommend adding any sweetener while the juice it still warm. At this point, you can chill it to serve or can it for later. Blue-white diamond sunlight filters through the meager canopy of branches. Wet leaves dampen the sound of Rachel’s footfalls and cling to her bare feet. Her arms embrace each other, hands rubbing away her shivers and prickled flesh. The salt trails of her tears dry on her face leaving her skin taut. Stars littered the sky when she walked away from the house full of grief-stricken people; so many family members and friends sitting shiva for her parents. Her little brother, Bartholomew, huddled in an overstuffed armchair in the corner of her grandparents’ living room. His wide eyes searched the room for the hugs and kisses that never came. Eventually, he fell asleep. As for the last question, she would have encouraged him to remove his socks and dress shoes, to feel the cool earth beneath his tender feet if only to distract him from his sadness. But he isn’t with her, and her sorrow hangs heavy in the dewy morning air. In a previous blog post involving my protagonist, Dr. John Welles, and his two Jewish friends, Reuben and Hannah Wise, I mentioned that the three were divided on the issue of forgiveness as it related to the Holocaust. For reasons that I’ll save for the publication of my novel, The Secrets of Dr. John Welles, each of them comes to the table with a different perspective on how the situation should be handled. When I first wrote the storyline involving the Wises and Dr. Welles, everyone ended up forgiving everyone else with hugs and smiles all around. I admit that I wrote these scenes fast and furiously for NaNoWriMo without having done my research and because I wasn’t sure what direction I wanted the storyline to take. Then two of my aunts attended a program on women Holocaust survivors and brought me some information on the subject. After reading the materials they gave me, I knew the scenes I wrote concerning the Wises and Dr. Welles were completely inaccurate, and therefore, unbelievable. I had to step back for a moment to analyze where my perspective of forgiveness came from and examine my knowledge of the Holocaust. Everything I learned about the Holocaust came during my school years, and I can tell you that for the purposes of writing a novel, the knowledge was slim compared to what I found when I conducted my research. I realized I was too far removed from the facts because I was too young to have experienced it firsthand and didn’t have a relative who either perished or survived the concentration camps. My original scenes were trashed, and I set about rewriting the story. Once the details of time and place were corrected, I worked on an aspect of my story that took me by surprise: the concept of forgiveness as understood by Jewish people who practice Judaism. My experience with forgiveness as I was taught might have influenced Dr. Welles but would seem ridiculous to Reuben and Hannah Wise. By applying my faith based instruction to the overall story, I denied my Jewish characters a single ounce of reality. The questions that kept going through my head, those that drove my characters, included 1) Do we forgive but not forget? 2) Can only God truly forgive? 3) Must the perpetrators of the crime repent and ask for forgiveness before it can be bestowed? 4) If the criminals are dead, can forgiveness take place? 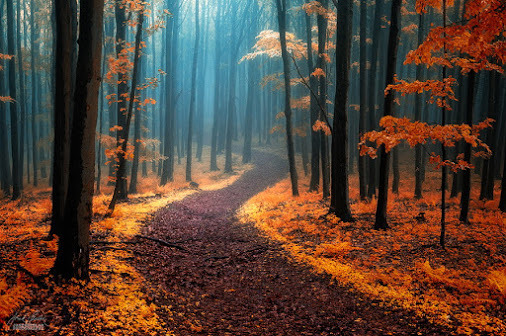 5) Should we forgive no matter what for every offense committed against us? There are many articles on the internet about forgiveness written from many different perspectives. I chose to draw on those based in Christianity and Judaism when writing my novel and peppered the views found there with heavy dashes of my characters’ own attitudes and viewpoints. The following article, “Can You Forgive Hitler?” written by Stewart Ain, September 22, 2006, for The Jewish Week, is the article that helped me the most when deciding how to have my characters react to the difficult questions and trying situation with which they struggled. It’s easy to say what I would do until faced with the death of my loved ones at the hands of evil people. Still, I wonder about Holocaust survivors who do forgive and maintain their faith regardless of the hell they endured versus those who refuse to forgive and lose their faith because of the hell they endured. It scares me to know that because of the condition of our world today, many are challenged with these same questions. Forgiveness is a tricky concept. It is easily applied to a situation when the transgression is minor. A forgotten birthday, a word misspoken in haste, a misunderstanding of perceptions; forgiveness is willingly doled out in each of these instances. But what about the attempted genocide of an entire people? Or searching one’s own soul in an effort to release a lifetime of guilt? Who is responsible to bestow forgiveness to the offenders when these are the circumstances? Man and/or God? These are the questions that trouble the minds of Reuben and Hannah Wise and Dr. John Welles after they dine together one January evening in 1955. All three are divided in their opinions concerning the particular events that generated their questions. 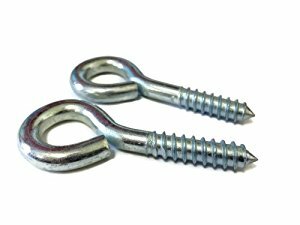 While they remain polite toward each other, a wedge has been driven into their friendship, especially between Hannah and John. I chose to have Reuben serve challah bread during the Shabbat meal to which he and Hannah invited John for two reasons. 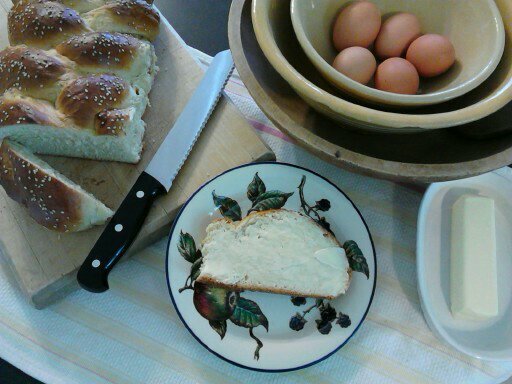 For one, challah is traditionally served during the observation of Shabbat. More importantly, though, the presence of bread during this significant meal drew attention to the many references of bread in the Bible as well as underscored the differences between the Wises and Dr. Welles. The following recipe is the one I had in mind for the challah Reuben made in my novel, The Secrets of Dr. John Welles. I hope you will enjoy this lightly sweet, rich, and delicious bread with your meals. In a Kitchen Aid mixer add 1 ½ cups lukewarm water and 2 tablespoons yeast. Mix gently and allow the yeast to foam. Add ½ cup sugar (or honey), ½ cup olive oil, 2 eggs, and ½ teaspoon salt. Mix well, approximately one minute or so. Add the six cups of flour one at a time and mix thoroughly with a bread hook. You may need to add ½ cup of flour if the dough is very sticky. 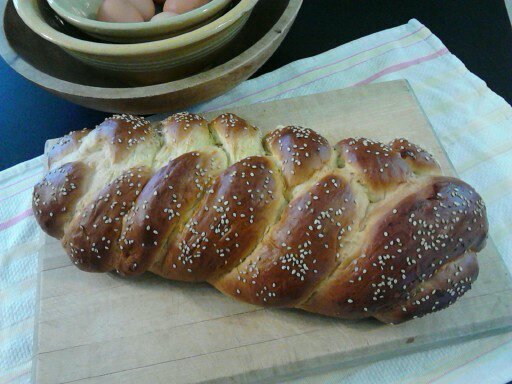 Brush each braided loaf with an egg wash (beaten egg with a little water to thin it). Place the braided loaves on a non-stick cookie sheet with parchment paper or a cooking mat on it and sprinkle liberally with poppy seeds, sesame seeds, or slivered almonds. Let the loaves rise until about 1/3 larger in size. Preheat the oven to 350 degrees. Bake the loaves for 23 – 25 minutes. Loaves should be golden and firm when finished. This recipe can also be mixed and kneaded by hand. Baruch Atah Adonai, Eloheinu Melech ha-olam, Ha-motzi lechem min ha-aretz. When I first chose the meal my protagonist, John Welles, would enjoy with Reuben and Hannah Wise, I flinched at including horseradish sauce. A website on authentic Jewish cooking suggested the pungent condiment as a topping for the salmon patties I had Hannah serving. I hate horseradish. My earliest memory of it involves cocktail sauce served at a seafood restaurant called Arthur Treacher’s that went out of business in our area years ago. My aunt was pumping the sauce out of a dispenser into little paper cups when one hefty pump spewed the offending sauce all over my shirt. I was mortified, and I guess my face showed as much because my aunt busted up laughing even as she wiped me off with paper napkins. To this day I can sniff out horseradish in any meal even as someone is setting the plate down in front of me. 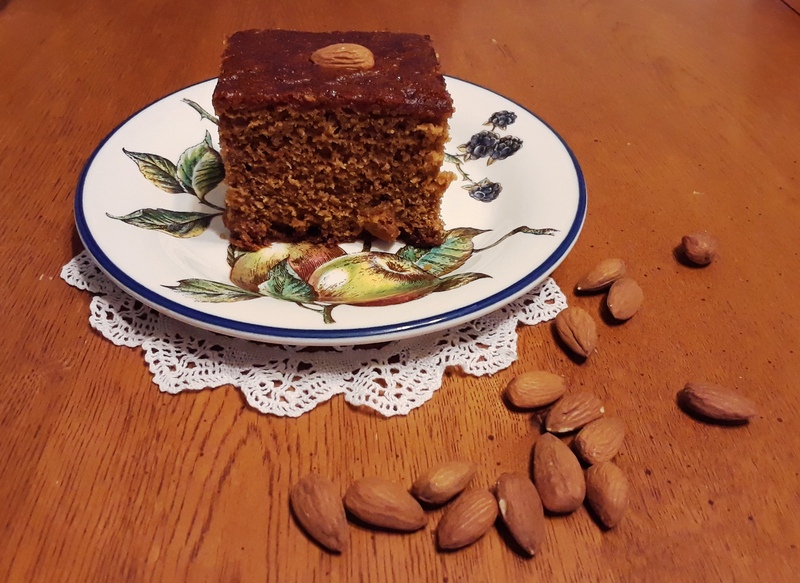 I was sure I wouldn’t include it in my Edible Fiction posts featuring food from my novel, The Secrets of Dr. John Welles. Until my mom made fresh horseradish sauce. Homemade horseradish sauce is a whole different creature. 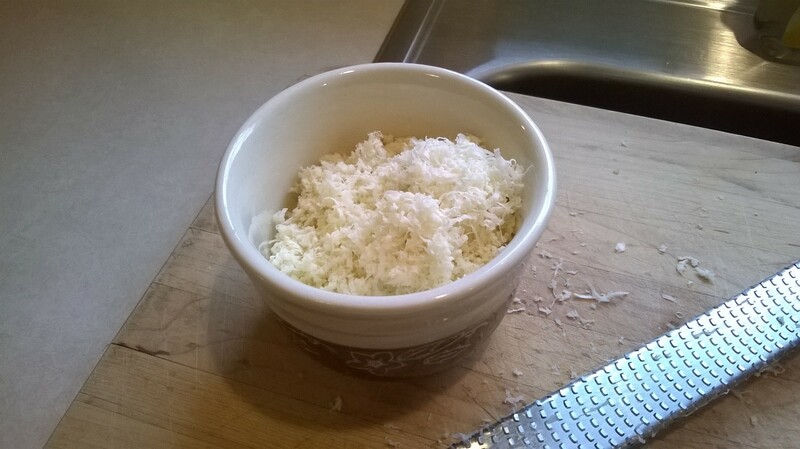 The key, as I discovered, was to grate the horseradish fresh instead of using the jarred stuff. Freshly grated horseradish is zesty like radishes; it actually has flavor. Unlike the jarred stuff, which is bitter without much flavor at all, fresh horseradish tastes like peppery herbs. As for recipes, there are thousands to be found for homemade horseradish sauce. I imagine Hannah would have mixed her freshly grated horseradish into a quality mayonnaise with a little salt and pepper to taste. Sour cream or crème fraiche is another suggestion as is the inclusion of white wine vinegar, chives, and Dijon mustard. You really can’t mess up the recipe; it’s just a matter of tasting as you create until you achieve the flavor you’re looking for. 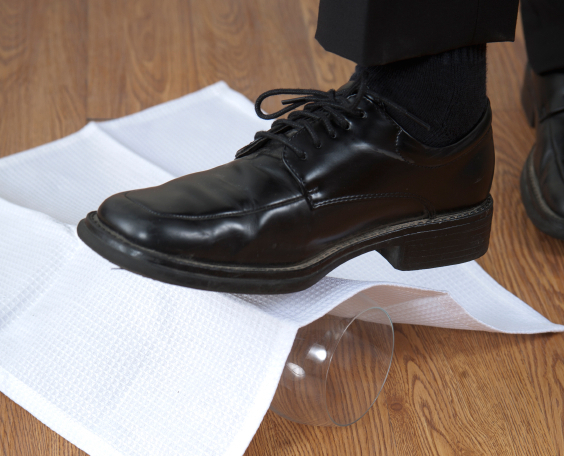 The following is a basic recipe that provides a great jumping off point. 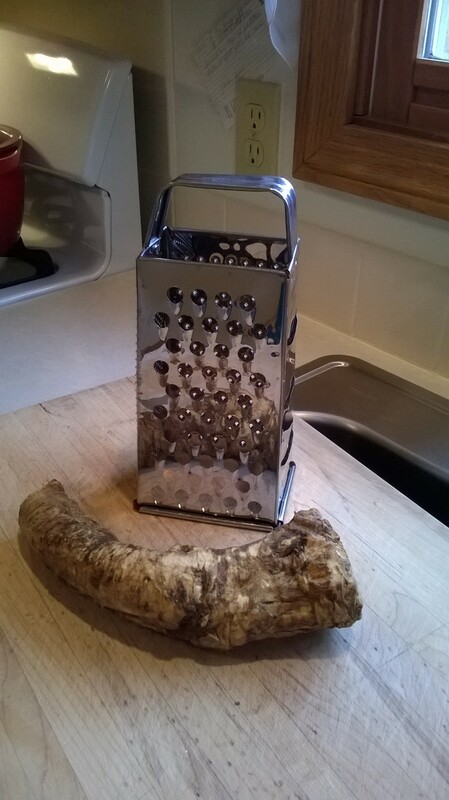 Peel and grate the horseradish root. Stir into the mayonnaise and season with salt and pepper.